Through the use of simple materials, Oh creates minimal three-dimensional structures that lead us to explore the space we occupy. Taking influence from performances by Rebecca Horn, the installation work of Eva Hesse, and the 60s and 70s works of Richard Tuttle and Sol LeWitt, Oh employs a minimalistic practice using string, weights, dowels, paint, plexiglas and graphite lines arranged in fragile compositions. Gravity, light, and shadows are essential components to his tenuous forms. Painted threads move between or across a wall in such a way that their visibility is subject to the viewers’ position. A unique combination of optical consequences, these works question the limits of our perception. As a whole, this new body of work by Oh reminds us of the often forgotten elegance of our daily lives, hopefully bringing our sense of urgency to a standstill. Following his first solo exhibition with MARC STRAUS in April of 2012, Oh was included in “Nothing and Everything” curated by MARC STRAUS Director Tim Hawkinson in January of 2013. 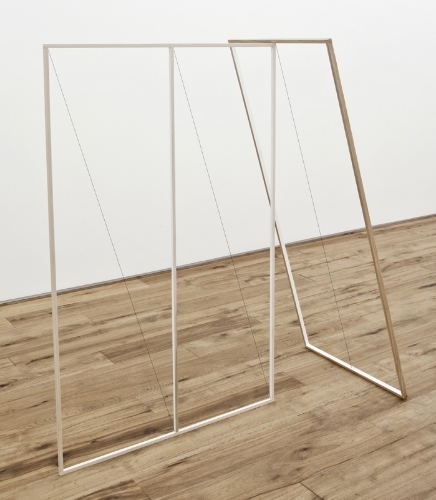 This exhibition presented Oh’s work within the context of important minimal sculptors from the 1960s such as Fred Sandback, Larry Bell, Robert Barry, and Carl Andre. Born in 1981 in Mauritania, Jong Oh spent his childhood in Grand Canaria, Spain. He earned a BFA in sculpture from Hongik University in Seoul, Korea and an MFA from School of Visual Art in New York City where he now lives and works. In 2012 he had solo exhibitions at Musee Miniscule, Art in General and Galerie Jochen Hempel, Berlin. His work has been included in numerous group exhibitions in Korea and New York including at the Hudson Valley Center for Contemporary Art, Doosan Gallery, and with the Korean Cultural Service in New York.